​This will be Stacey’s 5th year as Director of UDCNS. She taught Pre-K at UDCNS for 9 years and 1 year at Abington Presbyterian. She lives in Ambler with her husband Alex and her three sons. Stacey has her BS degree in Communication from Temple University, a Master of Education from Chestnut Hill College and is also a Reading Specialist. Stacey is a member of UDLC and serves on the Nursery School Board. Casey and her family are membesr of UDLC. ​​Diane has been teaching the Two Year old program for 16 years at UDCNS! Prior to that, she taught 2nd and 3rd grade for 12 years. She lives in Ambler with her husband John and daughter. 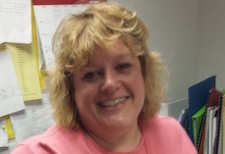 Diane has her BA in Education from Gwynedd Mercy College, and Master in Education from Beaver College (Arcadia). Diane is also a Reading Specialist. Cindy is starting her 9th year at UDCNS. Cindy will be teaching the 5 day Pre- K class with Mrs. Victoria Racz as her teaching assistant. She lives in North Wales with her husband Rich and daughter Alexandra, who is also a graduate of UDCNS!. Cindy has her BS in Accounting from Villanova University. Cindy is earned her Child Development Associate Certification this past year! Suzie has taught Pre-K at UDCNS for over 15 years. Suzie is teaching the four day Pre- K class this year with Mrs. Caroline Froelich as the teaching assistant. She lives Dresher with her husband Chris and three sons. She is an Extraordinary Eucharistic Minister and a FUSE youth group coordinator. Suzie has her BS in Education from Millersville University and a Masters of Information Science from Drexel University. This is Janel’s 5th year teaching for UDCNS. She will be teaching a three year old class with Mrs. Danielle Moore. She also substituted for 5 years in local elementary schools. Janel lives in Horsham with her husband Paul and three daughters. Janel has her BA from the University of Massachusetts and her Teaching Certificate from West Chester University. This is Caroline's 3rd year at UDCNS. Caroline is a Teaching Assistant in the Pre-K year old class with Mrs. Devlin. Caroline lives in Horsham with her husband and two daughters. She is a graduate of Archbishop Wood HS and has a BA from Marymount University. She has been an Assistant at various area nursery schools for 5 years. ​Sue has been a Teacher Assistant for over 10 years at UDCNS. Sue will be working with Mrs. CAsey Atherholt in the Three Year Old classroom. She lives in Lansdale with her husband, Mike and has two children. This is Danielle's first year here as a teaching assistant here at UDCNS. She has been a substitute teacher for the last couple of years. She will be helping out in the three year old classroom with Mrs. Janel Mullen. She lives in Ambler with her husband and 3 children. She has a degree in Human Resources from Villanova University. ​​Victoria is starting her 4th year at UDCNS. She will be working as a Teacher Assistant with Mrs. Cindy Falconio in the Pre-K classroom. Victoria lives in Ambler with her husband, Ernie, and two children. She graduated from Upper Dublin high school and has her degree in Occupational Therapy from Temple University. This is Erika's 2nd year as a Teacher Assistant her at UDCNS! She will be working with Mrs. Deane in the Tuesday and Thursday Two Year Old Class. Erika lives in Ambler with her husband and two children. Both of Erika's children are UDCNS ALUM! Erika has a BS in Graphic Design Communication from Philadelphia University. Erika earn an MA from Villanova in Theatre. This is Kira's thirdyear as a Teacher Assistant in our two year old class. She will be teaching with Mrs. Deane in the Monday and Wednesday two year old class. She lives in Ambler . She is a certified massage therapist. Kira is also an UDCNS alum! Our two year old kids just love Ms. Kira! ​ Heather Redd is happy to be returning to UDCNS after teaching here in 2006/2007. She will be working with Helen Walker in the Pre- K Class. Heather is a member of UDLC! She lives in Chalfont with her husband Chris and her three children. Helen Walker is beginning her first year here at UDCNS! She will be teaching the Three day Pre- K Class. Helen has 16 years of experience working with Pre- School Children. Helen lives in Blue Bell with her husband Gary and has two sons. Helen has a PA State Board of Private Academic Certificate.